The client’s order consisted of two suits and a couple of jackets. All the cloths were taken from the fabulous 2018 Cacciopolli bunch – more of which in a later posting. In these notes I’m going to focus on the suits. I love them both and am particularly drawn to the light grey suit. The cloth is a blend of linen, wool and silk. One of the big pluses of this fabric is that it doesn’t crease as much as cotton or a linen. The client has requested a peaked lapel, which is quite deep at 4inches. 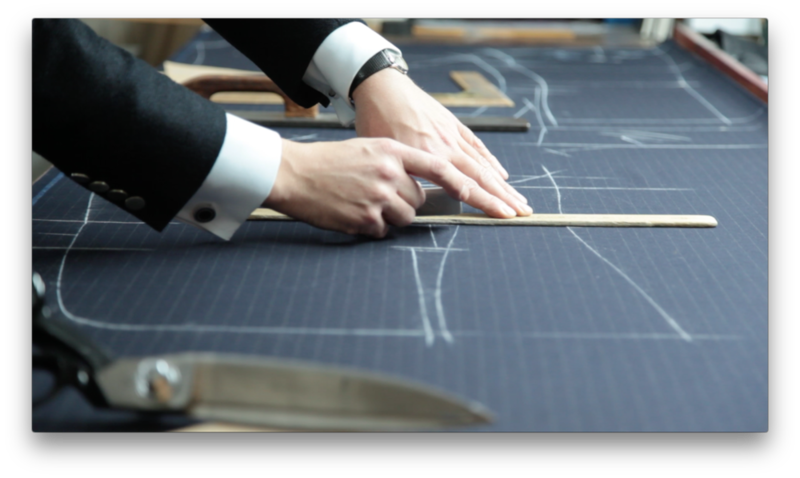 The lapel run has a straight edge, giving a very definite sharpness to the garment. The trousers are cut slim and at the hem they are 14.5inches. They silver buckle is another neat touch and adds a summery feel, I think. While it is a suit, you could easily wear the items as separates. The trousers would like great with a pair of smart white sneakers and a white tee-shirt. How cool would that be? The other suit is in a very striking cobalt blue. I can just imagine it looking amazing on the French Riviera or the Amalfi coast in Italy. This is a great daytime suit and would also look good at an early-evening drinks party high on a roof terrace, catching the last hours of sunlight. The suit has a notch lapel, which is deemed by most people to be more classic. All the jackets in the collection are half-lined and the shoulders have a softer look, although they are semi-roped. The suits have side-vents.